Special OfferFree Bonus - 5K EVERYDAY! We chose this hotel based on the reviews on Tripadvisor, big mistake! The room was cheap but far from good value. The walls are so thin you can hear your neighbours talking and I was woken up throughout the night by all sorts of noises. The noise was unbearable how when we spoke to the staff they said we had one of the ‘most quiet rooms’. The towels were also old, worn and had holes in them. Overall we were not impressed. Would not recommend this hotel. Location couldn't be better than this. 10min walk to Gangnam station, 2min to Shin-nonhyun, 5min to bus. Room was small and clean but not in the best condition. Everything seemed old, or just not well cared for. Gym has seen better days. Dusty, cramped, couple machines broken, just makes you want to go back to your room. Laundry is in the Gym... free to use but need to buy detergent. Not in the best condition (dirty). I get the sense that entire room has been neglected and forgotten. Not totally disappointed because the location was so fantastic, but most likely will not be revisiting. I stayed 3 nights at this hotel bc it was close to where my son was living in Gangnam and affordable. It was reasonably comfortable and quiet and well located. 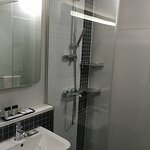 But the afternoon after leaving the hotel for Japan, I noticed bites all over my torso, back, shoulders. There are raised red bumps that if you research bedbug bites, are identical. They sting and are itchy and I can't go to the onsen bc others would be disturbed. Such a bummer to encounter this. In the states we have The Bedbug Registry which is very useful when booking hotels. You can check to see if any were reported before you book. 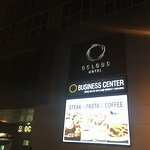 I emailed Ocloud hotel as soon as I discovered this but have not heard back. Nothing. This is terrible bc bedbugs will ruin an entire hotel or apartment if they are not caught early. Judging by the sheer amount of bites on my body, these bugs were numerous and hungry. Please find a hotel elsewhere. This can happen to you. 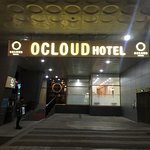 Hello, this is OCLOUD Hotel. Our hotel is having periodic inspection of rooms through the vermin extermination company and any of insects or bugs, however, were not found in the room. Also, we have double checked with other guests who have stayed in the same room before and after your stay, in which they have never mentioned about any of this problem. Nevertheless, if you could have informed us about your inconvenience during your stay, we may address your concern and take measures, but there is no more service that can be provided since you have already checked out from our hotel. Please understand this and we hope you enjoy your trip. Thank you. Near all the actions in Gangnam! It has a perfect location - 10-walk to the bus station and subway station. You have access to the shopping area selling international and local brands, restaurants (including shake shack). There are several 7-11s plus Starbucks near the hotel. We stayed in a deluxe room which is spacious, clean, and comfortable. The staff are very helpful and communicate well in English. 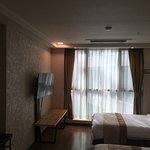 I will stay again in this hotel if I have the chance to go back again to Seoul. This was a good stay at Ocloud Hotel. > The receptionist didn't allow for early check-in, which is disappointing, because I was only an hour early, and when you're only an hour early, "rooms aren't clean yet" is a terrible excuse because let's be real, housekeeping does their work late in the morning, not at 1:00 PM. And this is super minor, but I didn't like the fact that during my check-in process, all receptionists were male. Made me feel slightly uncomfortable, especially given Korea's reputation of being a country where you may be sneakily recorded. > Rooms are slightly on the smaller side, especially if you're two people booking for a standard double room. > Very convenient location. There's shopping (e.g. major beauty brands, and a Zara) just a few minutes walk away from the hotel. There are at least two different convenience stores to shop for late night essentials. > The room has a microwave and it even has utensils to eat instant noodles! So convenient. > They offer four pillows for a standard double bed. Super comfy.